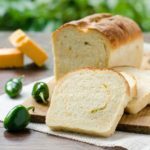 A recipe for cheddar jalapeño bread made with sourdough starter, fresh jalapeño peppers, and grated cheddar cheese. It is great for sandwiches or with soup. Grease a large bowl. Lightly grease two 9- X 5-inch loaf pans. In the bowl of a stand mixer, dissolve yeast in warm water (110° to 115°) and let sit for 5 minutes. Make sure the yeast blooms (small bubbles form). Add 2 cups of flour, starter, sugar, and salt. Stir together using the flat beater on a low speed. Change flat beater to a dough hook. Add flour 1/2 cup at a time until you have a firm dough and the bowl is “clean” (dough has pulled in all the flour). Continue kneading with dough hook for about 5 minutes. Put dough on a lightly floured surface and knead by hand a few times to make sure it is smooth and elastic. Add in some of the jalapeno slices and cheese while kneading. Shape into a ball. Place in the greased bowl and turn to coat dough ball all over. Cover the dough loosely with plastic wrap or a slightly damp tea towel and set bowl in a warm spot. Let dough rise until doubled, about 1 to 1½ hours. Punch down dough. Divide into two equal parts. On a lightly floured surface, roll the dough half out to a 12- x 9-inch rectangle. Sprinkle half of the remaining cheese and jalapeno slices over the dough. Starting with the shorter side, roll it up tightly and pressing down while rolling. Pinch the edges and ends to seal. Place dough seam side down in prepared loaf pan. Repeat with remaing dough half. Cover with a towel and let rise at room temperature until doubled in size, about 45 to 60 minutes. About 30 minutes into the second rise, pre-heat the oven to 400°F. Once the loaves have doubled, make a slash across the top of the loaves using a sharp knife. Bake at 400ºF for about 30 minutes until golden brown. For extra crispy top crust, spray cold water several times while baking. Remove loaves immediately from pans and cool completely on a cooling rack before slicing. A recipe for cheddar jalapeño bread made with sourdough starter, fresh jalapeño peppers, and grated cheddar cheese. It is great for sandwiches or with soup. - Time does not include rise time.